It is generally accepted that people read in order to understand themselves and the world around them, to expand their personal insight. Most of us take for granted the act of reading in our daily lives, but a history of reading shows that it changed and developed like all other human activities. While we think of reading as an intensely personal and usually silent activity, it used to be very different. In the Argentina-born writer Alberto Manguel’s book A History of Reading we learn that people used to always read aloud. Early Greek and Latin texts were written without punctuation or separations between words, just a continuous string of words that had to be read aloud, sounded out, in order to get the meaning of the words in relation to each other. It wasn’t until the 9th century that silent reading became common. Something of reading’s early mystery still remains when we consider poetry, writing that is written for sound. There are those who would argue that half the beauty of poetry is lost if it is not read aloud; that when they read silently people learn to look for meaning rather than respond to the beauty of what they hear. At the age of 73 W.B. Yeats is said to have commented that he had spent his entire life as a poet taking out of his poetry everything that had been written for the eye alone and using only those words that spoke to the ear. In Sri Aurobindo we have a poet extraordinaire and in his epic poem Savitri, a poetic experience in reading aloud or listening that has touched many souls. Narad (Richard Eggenberger), who has been reading and reciting Savitri for the last 45 years, reminds us that each line of the poem is mantric, and it is the power of the mantra that can put us into contact with the spiritual experiences described in the poem. He points to the Author’s Note at the start of Savitri, where Sri Aurobindo says that “still this is not a mere allegory, the characters are not personified qualities, but incarnations or emanations of living and conscious Forces with whom we can enter into concrete touch and they take human bodies in order to help man and show him the way from his mortal state to a divine consciousness and immortal life." The art of listening to or reciting good poetry is then no mystery, but a revelation to the inner being, a development of the capacity to hear and see and feel a world of Beauty, Truth, and Love. Maggi Lidchi-Grassi introduces her new volume of poems by recounting her experience of the force that descended on 1st January 1969 and how its descent released a wave of poetic activity in her. The poems in this collection are intensely personal reflections, recording the inner experiences of a seeker through her spiritual struggles, awakenings, and moments of grace at the feet of Sri Aurobindo and the Mother. 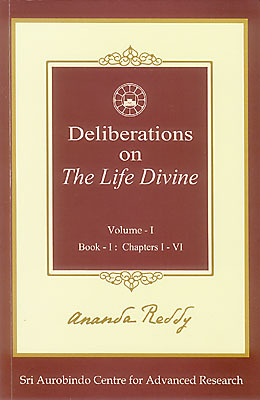 The first in a series of projected volumes, this book is a transcribed edited version of talks delivered by the author on the first six chapters of Sri Aurobindo’s The Life Divine. Dr Reddy’s approach is to explain in the simplest of terms the main philosophical arguments presented by Sri Aurobindo by showing how he takes up an argument from multiple viewpoints and then finds a natural and unifying synthesis through spiritual experience and intellectual thought. The author has kept intact the direct, expository tone of the talks, making this an easily approachable book. Each chapter studies the main arguments in brief and is followed by lecture notes that encapsulate the contents in outline form.